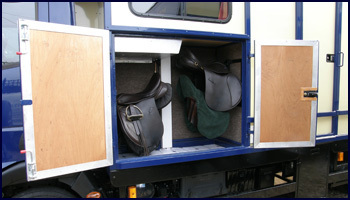 Since 1976 we have been building bespoke horseboxes to meet the individual requirements of our customers and their horses. Our sturdy boxes are built for safety, comfort, durability and practicality. • Expertly engineered ramps which are both strong and easy to operate and about which we are particularly proud. This is essential for routine engine servicing as well as more major repairs. • Our boxes are usually clad with polyester powder coated aluminium, which minimises scratching and gives long lasting good looks. Our stock colour is Cream but any colour is possible as an optional extra. Alternatives are mill finish aluminium and hardwood. • Steel frame construction with the inside of the horse area walls lined with plywood and galvanized steel, Stokbord© or rubber. Above that the walls can either be stained plywood or lined with white-faced board. • Strong horse partitions, either solid to the floor or skirted. In a herringbone format these can be telescopic partitions mounted on adjustable racks for maximum adaptability. Partition frames and internal metalwork can be galvanized or painted to match the frame of the box. • Our hardwood floors have proven to be long-lasting, durable and easy to look after, but aluminium planking is available as a slightly lighter weight alternative. All floors include drainage. • One piece aluminium roof eliminates any risk of leaks and lined with white-faced board makes for a light bright horse area. • Ample opening windows to maximise light and ventilation. In the horse area those near the horses’ heads are fitted with grilles. • Rubber gripface matting provides non-slip grip on the ramp. • Hard wearing solid rubber mats are flush-fitted throughout the horse area floor for comfort and safety and they can be removed for cleaning. • Ramp doors or gates. • Groom’s door and steps. • Tie rings, inside and outside. We are a principal stockist for Rice and Richardson horse trailers, supplying new and used trailers as well as servicing and repairing all makes of trailer. 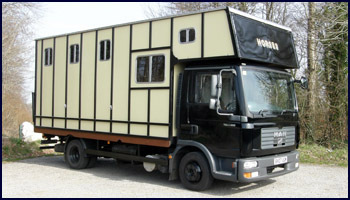 Selection of new and good used horseboxes and trailers available.